K-Chlorophyll Transparent Soap is made from gentle plant-based fatty acids and natural skin-caring ingredients such as chlorophyll, glycerin, aloe extract and vitamin E, which help provide nourishment and protect the skin from harmful environmental aggressors, keeping it soft and supple. Its mild formula has lower pH compared to normal soaps, hence suitable for the whole family and daily use. K-Chlorophyll Transparent Soap contains chlorophyll, which gives it a clear and a lovely green color appearance, plus the benefits of chlorophyll in maintaining healthy and youthful looking skin. Chlorophyll provides the skin with essential nutrients including vitamins and minerals, and is packed with antioxidants to help neutralize free radicals that contribute to skin aging. Chlorophyll has anti-bacterial and anti-inflammatory properties, which help soothe and reduce infections that leat to breakouts, as well as to promote healing of wounds. Above all, it is very safe, non-irritating and suitable for all skin types. 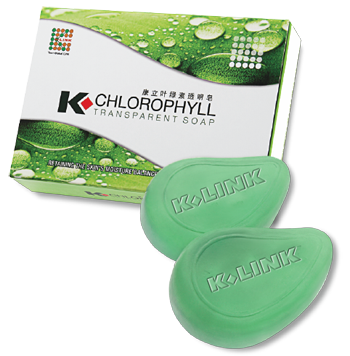 K-Chlorophyll Transparent Soap is also enriched with Glycerin, Aloe Extract and Vitamin E to help calm and moisturize the skin. Glycerin - An effective moisturizer that helps protect the skin's barrier function, prevents dryness, improves skin health, making it softe and supple. Vitamin E - Protects the skin from sun damage as well as the harmful free radicals, helps the skin retain its natural moisture and improves conplexion. Extra Tips: How to make a soap last longer?